Pianist and composer Anthony Coleman has been one of the key figures of New York music for nearly four decades. His work bridges the gap between Composition and Improvisation, Uptown and Downtown, and spans a wide range of genres and practices including Free Improvisation, Jazz, Jewish music (of various types), and Contemporary Chamber Music. Balancing a powerful sense of structural logic and expressionistic color, Coleman has had a prolific career as a composer, too. He has been an esteemed member of the faculty of the New England Conservatory since 2006. Francisco Mela is a favorite amongst jazz's elite instrumentalists, among them, Joe Lovano, John Scofield, JoAnne Brackeen, Kenny Barron, Gary Bartz, Bobby Watsonand McCoy Tyner, all of whom cite his charisma, sophistication, and life-affirming spirit as an extension of his incredible talents as a composer and drummer. Francisco was born in 1968 in Bayamo, Cuba. He moved to Boston in 2000 to pursue a degree at the acclaimed Berklee College of Music and, quickly thereafter, the faculty recognized that Mela had much to offer students and promptly hired him to teach at the school. Mela rapidly made a name for himself on the Boston scene, becoming the house drummer at the legendary Wally’s Café Jazz Club. It was at Wally’s that Mela began developing a concept for his own band, one that would feature the sounds of Fellow Berklee faculty member and world-renown saxophonist, Joe Lovano, heard Mela and was immediately impressed, hiring him shortly after to play in his quartet. Henry Fraser (b. 1991) is a bassist, composer, and improviser from Boston, MA, now in Brooklyn. 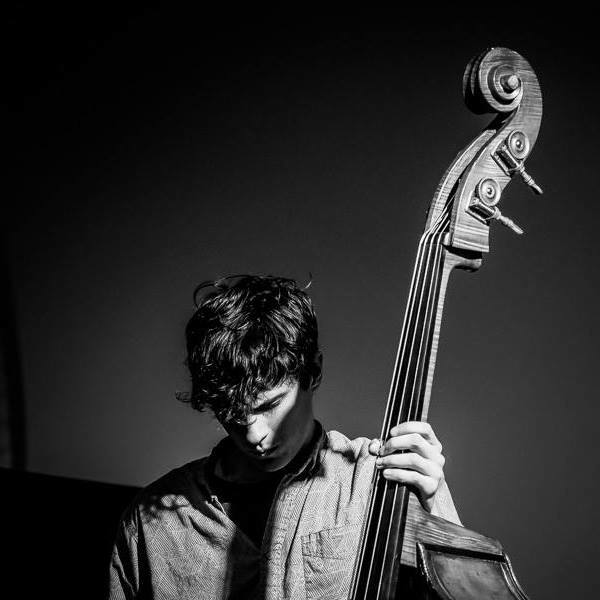 He received his BA from New England Conservatory of Music in the spring of 2014, where he studied with Cecil McBee, John McNeil, Dave Holland, Anthony Coleman, & Ted Reichman. Henry's parallel pursuits of technical mastery and novel experimentation have put him at the forefront of the experimental music scene in New York and beyond, playing at such venues as Moers Festival, Panama Jazz Festival, New Orleans Jazz & Heritage Festival, (Le) Poisson Rouge, Roulette Intermedium and Joe's Pub. Henry has worked with Joe Morris, Tony Malaby, Mat Maneri, Weasel Walter, Axel Dörner, Judith Berkson, Ryan Power, Charmaine Lee, Chris Pitsiokos, and many others. Current projects include CP Unit, Brandon Seabrook Trio, Anthony Coleman Trio, The Full Salon, and solo music for the double bass. The Creative Music Series (CMS) was established in January, 2015, to showcase the work of adventurous jazz musicians from out-of-state, presenting them in intimate venues in the Cambridge/Somerville area. My endeavor was a reaction to the apparent lack of invitations being extended to accomplished, new talent and even unknown musicians to the Boston arcea. CMS has now begun to zero in on Boston based musicians who are creating their own projects with these out-of-town guests, and taking these musical risks to find an expression and gain a wider appreciation.